5am wake up call- celebrating the beginning of a new day. 6am turkey burner competition at the gym- celebrating my healthy body and good friends that support me. turkey bowl- celebrating my spontaneity, good friends, and my healthy athletic body. feasting with my family- celebrating quality time with family that I don't get to see very often.and sharing my talents with others. conversation- celebrating quality time with my mom and having a much needed conversation for both of us. bedtime- celebrating a warm home, reflection on the day and preparation for a new day. I felt so much gratitude yesterday that I literally wanted to shout it from the roof tops. So here I am on my proverbial roof top shouting at the top of my lungs. Thank you! Thank you! Thank you! My Heavenly Father has given me so much who would I be not to be grateful to him for all he has provided me with. What a great day to re-align my thoughts and focus on gratitude. What are some things that you are Grateful for every day? Challenge: Find something simple in your day and reflect on how it assists you in celebrating gratitude. Have you ever had a day when you just felt like you couldn't take any more? You work so hard to accomplish everything, but nothing seems to work out the way you wanted it to? You're overwhelmed by everything going on in your life? I've been having a lot of these days the last couple of months. The past couple of week's I've been off of work and I've really been taking time to think about life and how I can take better care of myself. I'm so thankful for the inspiration my Heavenly Father has blessed me with and I want to share with you some thoughts that I've had. and applied it to our teaching. I was once again awakened to how it applies to my life. 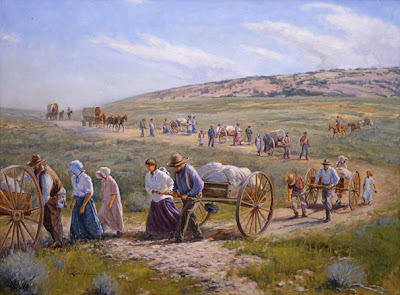 In July of 1847 Brigham Young and other members of the Church of Jesus Christ of Latter-Day Saints entered the Salt Lake Valley. They settled here and began working to build a life free from the persecution they had in other areas they settled in. Between 1847 and 1869 about 70,000 members of the LDS church traveled to Utah to gather with the Saints there. Most of them traveled in wagon companies, but about 4,000 of them came by handcart. The handcarts could only hold so much and many families and individuals had to make hard choices about what to leave behind. There are many stories of family heirlooms being left behind, dishes, jewlery boxes, grandfather clocks... Only the most important things made the cut. Most of these things included extra clothes and blankets and other things that were necesary to their survival as they crossed the vast plains, even with these essentials some still died along the way. A few years ago, Elder Jeffrey R. Holland shared his feelings about the deep-rooted faith of pioneers who pushed toward the Salt Lake Valley even after the deaths of their children. He said, "They didn’t do that for a program, they didn’t do it for a social activity, they did it because the faith of the gospel of Jesus Christ was in their soul, it was in the marrow of their bones. I have had the blessing of being able to participate in three different pioneer treks. As a youth and as a young single adult. They were hard for me to do, and I was a healthy well fed person only doing a small 18ish miles. I cannot even imagine how difficult it was for those first pioneers. Each of these experiences helped me to learn and grow. I was able to come closer to my Father in Heaven, just as those early pioneers did as they crossed the plains. We are not asked today to leave everything behind and travel across a country on foot over rough terrain to show our faith and devotion to the Gospel of Jesus Christ. We instead travel the rough terrain of the last days. We get to work on overcoming temptations, selfishness, stress and much, much more. We battle it out every day in our thoughts, words and deeds. *Is the word of the Lord written on my heart? *What am I carrying in my handcart? and my Savior have me carry in my handcart? *What things can I throw out of my cart to lighten my load? *What can I do to write the laws and doctorine of God on my heart? that isn't essential for me to get to eternal life. that are essential were getting buried under all of it. 1. I'm letting go of the TV shows that I watch during the week and instead investing that time to studying the gospel or serving others. 2. I am only on my social media (facebook, twitter, etc) once a day for no more than 10 minutes. 3. I am letting go of my stringent schedule for Soulful Brilliance and instead handing the control over to my Heavenly Father to lead and guide this blog to where he would like it to be. My challenge to you today is to also ask yourself the questions from above. Write in your journal about them and then choose three things that you could throw out of your cart to lighten your load. Then comment below about what you are letting go of or email your list to me at meg@soulfulbrilliance.com. Remember that when you share your story you are helping others to find the courage to change! :0) If you can't think of anything to let go of or if you are hesitant to let go of something, pray to your Father in Heaven and ask for assistance. We can do all things through Christ! (Alma 26:11-13) This the enabling power of the Atonement! The Lord will send angels to attend you. "'We suffered beyond anything you can imagine, and many died of exposure and starvation...[But we] came through with the absolute knowledge that God lives, for we became acquainted with Him in our extremities. "'I have pulled my handcart when I was so weak and weary from illness and lack of food that I could hardly put one foot ahead of the other. I have looked ahead and seen a patch of sand or a hill slope and I have said, I can go only that far and there I must give up, for I cannot pull the load through it. I have gone to that sand, and when I reached it, the cart began pushing me. I have looked back many times to see who was pushing my cart, but my eyes saw no one. I knew then that the angels of God were there. It is my hope that we can live our lives remembering the important things and writing the words and doctrines of Christ on our hearts that when we finally get through our journey that we too will be grateful for the privelege to become better acquainted with our Heavenly Father! Meg is such an inspiration wouldn’t you say? I’m glad that I could be there to help her conquer a fear of hers. What a great blog post about acting, and not letting our fears paralyze us. It really got me to think about fears in my life, and if I am acting or being crippled by them. I came to the realization the past couple weeks that I am being crippled by a fear that I have had for many years. I have a fear of having authentic conversations with people, because I don’t want my words to hurt those who I am having a conversation with. After reading Megz blog post though, I had an opportunity come into my life to use the things she taught to act instead of being paralyzed. A friend of mine confronted me about some actions of mine, and what she thought that they meant. I was hurt and shocked by the accusations that were placed on me. At first, I just wanted to run from the situation because I was afraid that if I tried to talk about this with her I would just lose control of my emotions and say something that would hurt her like I was hurt. I had that post come to mind, and made the decision then to act. I told myself that it was important to set the record straight and talk about my actions and the intentions behind them. I was terrified, but as I chose to act we were able to talk about what was going on and get things resolved. Had I not made the decision to act, things would probably be a lot worse. My friend Mal pointed me to this message from Elder Jeffrey R. Holland, an apostle in the Church of Jesus Christ of Latter Day Saints. He says, “Don’t you quit. You keep walking. You keep trying. There is help and happiness ahead. It will be all right in the end. Trust God and believe in good things to come.” This really helped me with the worry that by being honest in this authentic conversation I might have hurt this friend. I felt right about the things that I said, and from this message was able to find hope that the best would happen. I am pleased to report that while things aren’t perfect, by my acting we were able to work things out. Things are on the mend, and we were able to change things before it got to the point where more hurt was going to happen. Trust in the greatness in you, and the ability you have to overcome your fears by acting. I love the line from We Bought a Zoo where the dad says, “You just need to have 20 seconds of insane courage.” Sometimes good things happen in small steps. So don’t be afraid to keep moving no matter how small the step. We all have to start somewhere.